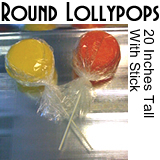 Big Round Lollipop - 20 Inches Tall - Dino Rentos Studios, INC. This full 3D lollipop prop is 20" tall and is painted the color of your choice and wrapped in cellophane. Price is for 1 Lollipop.